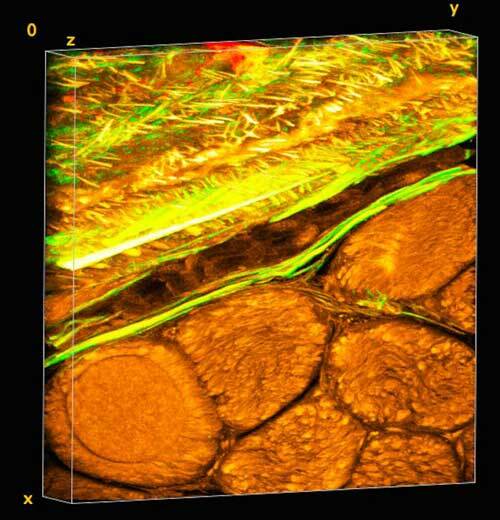 (Nanowerk News) For the first time, UNSW biomedical engineers have woven a 'smart' fabric that mimics the sophisticated and complex properties of one nature's ingenious materials, the bone tissue periosteum. Potential future applications range from protective suits that stiffen under high impact for skiers, racing-car drivers and astronauts, through to 'intelligent' compression bandages for deep-vein thrombosis that respond to the wearer's movement and safer steel-belt radial tyres. The research is published today in Nature's Scientific Reports ("Scale-up of nature’s tissue weaving algorithms to engineer advanced functional materials"). Many animal and plant tissues exhibit 'smart' and adaptive properties. One such material is the periosteum, a soft tissue sleeve that envelops most bony surfaces in the body. The complex arrangement of collagen, elastin and other structural proteins gives periosteum amazing resilience and provides bones with added strength under high impact loads. Until now, a lack of scalable 'bottom-up' approaches by researchers has stymied their ability to use smart tissues to create advanced functional materials. UNSW's Paul Trainor Chair of Biomedical Engineering, Professor Melissa Knothe Tate, said her team had for the first time mapped the complex tissue architectures of the periosteum, visualised them in 3D on a computer, scaled up the key components and produced prototypes using weaving loom technology. "The result is a series of textile swatch prototypes that mimic periosteum's smart stress-strain properties. We have also demonstrated the feasibility of using this technique to test other fibres to produce a whole range of new textiles," Professor Knothe Tate said. "We then tested the feasibility of rendering periosteum's natural tissue weaves using computer-aided design software," Professor Knothe Tate said. The computer modelling allowed the researchers to scale up nature's architectural patterns to weave periosteum-inspired, multidimensional fabrics using a state-of-the-art computer-controlled jacquard loom. The loom is known as the original rudimentary computer, first unveiled in 1801. "The challenge with using collagen and elastin is their fibres, that are too small to fit into the loom. So we used elastic material that mimics elastin and silk that mimics collagen," Professor Knothe Tate said. In a first test of the scaled-up tissue weaving concept, a series of textile swatch prototypes were woven, using specific combinations of collagen and elastin in a twill pattern designed to mirror periosteum's weave. Mechanical testing of the swatches showed they exhibited similar properties found in periosteum's natural collagen and elastin weave. While the materials produced by the jacquard loom have potential manufacturing applications - one tyremaker believes a titanium weave could spawn a new generation of thinner, stronger and safer steel-belt radials - the UNSW team is ultimately focused on the machine's human potential. "Our longer term goal is to weave biological tissues - essentially human body parts - in the lab to replace and repair our failing joints that reflect the biology, architecture and mechanical properties of the periosteum," Ms Ng said. An NHMRC development grant received in November will allow the team to take its research to the next phase. The researchers will work with the Cleveland Clinic and the University of Sydney's Professor Tony Weiss to develop and commercialise prototype bone implants for pre-clinical research, using the 'smart' technology, within three years.